This chicken dish is homey yet classy. The warm scents of rosemary and garlic made my kitchen smell amazing and the chicken was the delicious match with a simple green salad and crusty sourdough bread. I used a robust extra virgin olive oil in the pesto—perfect for standing up to the bold lemon and rosemary flavors in this dish. Combine walnuts, parsley, garlic, olive oil, rosemary, lemon juice and zest, salt and pepper in a food processor until a chunky paste forms. 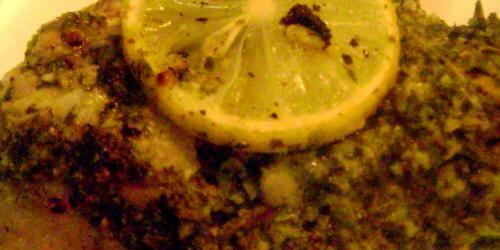 Place chicken in a baking dish and slather pesto between the chicken skin and flesh and on top of the skin. Top chicken with lemon slices and cover tightly with foil. Bake for 30-40 minutes or until chicken is juicy. Place under broiler for a few moments to lightly crisp skin. Serve hot. I made this Sunday night and it was great. Thanks! Made this delicous chicken dinner recipe last night and was really impressed. Great dish to serve when hosting a dinner party looks and tastes fancy but doesn’t break the bank. You always come with so delicious recipes . It looks so testy. I will try this must. Currently concerned the bottom line, ways to make a “Brand-new account” or “Login” to the old account. We will certainly cover each subject one at a time. I needed to claim thanks to for this vital take a gander at!! I genuinely take an interest in each touch of it I have you bookmarked to glance at new impacts you disperse.